According to VisionMobile’s survey data, IoT developers both use and contribute to open source projects. This isn’t surprising given the wealth of open source options available to IoT developers, whether software, hardware, or data. As for opera ting systems, developers can choose between Raspbian, Ubuntu Core, Google Brillo, Contiki, FreeRTOS, or other open options. For frameworks or libraries developers are also spoiled for choice: Siddhi, bip.io, KinomaJS, RHIOT, Zetta, and Yaler, among many others. In fact, the software options are so rich that 71% of IoT developers expect to use one or more of these options. Indeed, hardware components like Raspberry Pi, Arduino, Flutter, and more capture the fealty of 77% of IoT developers. Beyond software and hardware, by some estimates 41% of developers not only use but also publish open data for IoT. That open source is more than a matter of a $0.00 price tag is clear from contribution levels. A majority – 58% – of IoT developers contribute back in at least one part of the stack. Yes, core contribution rates are somewhat low – 9% to 12% – but this is true of open source, generally. It turns out that it’s very hard to invest the time necessary to build up enough expertise in a particular project to become a core committer. Even so, developers remain committed to open source even when they’re not steering IoT projects. A majority – 55% – cite ideology as the key driving factor behind their open source adoption, while a lesser 35% indicate they use it because it’s the best option due to community updates. This isn’t to suggest that IoT developers are pie-in-the-sky idealists. Thirty-two percent do indicate they like the community support, and it’s telling that the above-mentioned 35% believe open sourcde is better because communities make it so. 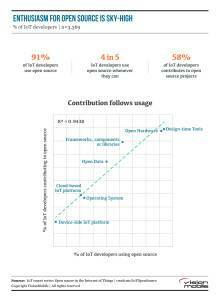 The popularity of open source communities increases from 49% for IoT developers with less than a year of software experience to 70% for developers with over 6 years’ experience. They are are the second most important source of information for IoT developers, right after vendor documentation. Likewise, the popularity of Q&A sites increases from 39% (no experience) to 58% (6+ years’ experience). However, there’s a big caveat in all this free-as-in-speech love for open source: hobbyist developers tend to care much more about software freedom, and they still comprise a big chunk of the IoT developer population. A full 64% of the hobbyist crowd is into the freedom ideology of open source, whereas professional developers skew pragmatic. In other words, while open source will remain a big deal to IoT developers even as the space commercializes, we’re likely to see it embraced more for its quality than for its ideology over time.